Roots are the basis of any orchid plant. It’s very important for your orchid to have a robust root system; the orchid takes in water and nutrients through its roots which in turn allows the whole plant to grow, thrive, and ultimately put out those beautiful blooms. When you bring home a new Phal, it’s best to take it out of the pot right away, remove any potting medium that’s stuck to the roots, and take a look at them. If you find any rotten roots, make sure to trim them away with a sterilized cutting tool (a razor blade or gardening shears will do the trick). Then repot the plant in fresh medium and it should be much happier. Root rot can lead to mold or may even spread to the nearby roots and slowly kill the plant. Congrats on your first orchid, Molly! Some of those roots do look dead. The dry brown twisty ones are rotten and aren’t going to do anything to nourish the plant. You should trim those away with a sterile knife or scissors. I also recommend removing the whole plant from the pot and inspecting the rest of its roots to see how those are doing. If any of them are rotten, you should cut those too, and then you can repot the plant after you’ve removed the dead material. I hope that helps – good luck!! I unpotted it. Some of the roots are green but the majority of them are white with green at the tips. Are these ok, or rotten? It’s hard to say without seeing a photo. Feel the roots – are they firm, or squishy? If they are firm then they are most likely fine. When roots start to rot they get squishy (when wet) or feel crunchy and hollow (when dry). And as far as texture, they feel hard and crisp. Not squishy or dry. I have just bought my first 2 Moth orchids and B&Q Diy were selling them cheap. I would like to thank you for your posting as this has been the most usefull of the pages and pages I have trolled theough on the internet. Hi Martyn, thanks so much for the kind words. I’m glad that I could help! The question I now have is………………..what do I do to the shriveled white roots? Try feeling the roots. If they’re mushy, then they are rotting and should be cut with sterile garden shears or clippers. If they are firm, however, then they are still in good shape and are probably just dehydrated. If they are aerial roots (growing outside the pot) it’s good to mist them with water once a day to keep them hydrated. Thanks for your reply. I`ll cut the wilted bits now. live in CA. I am new at this and need to find all the info I can. Anyone have advice on growing orchids on trees. I have a potted orchid that is 5 years old, to water it I am to place an ice cube 3 times a week, I have noticed that I have silver things coming out of the pot with tan/brown tips,, look like roots, I don’t know what to do, the stem for the orchids is growing for the flowers,, I don’t know how to replant or if I am suppose to,, this is my first plant. Can you help me, Some ppl on your site said to spray water on the roots,, but like I said my plant directions says to use ice to water it. Since you have a new flower spike growing, I recommend not repotting just yet. You can wait until the orchid has finished flowering and then repot it, taking care to cut away any roots that may be rotten. I just got what I think is a phal as a gift. I did as instructed, however, the roots are wound so tightly in the middle in a sort of spiral growth that I couldn’t get the moss stuff that I was afraid to pull it out for fear of damaging the roots. I cut away what rot I could t hen repotted in the same container it came in. Should I get it a bigger pot? Hi there — orchids actually like to be pretty pot-bound, so you may not need to get a bigger pot just yet. You are going to want to try to get the rest of the moss out of the center of the roots. What might help is if you remove the plant from the potting medium and run it under water for a bit to soften the root mass and help loosen up the middle. Just be patient and you’ll be able to get the moss out of there. Good luck! I’ve found your page so informative! I hope you can help me out. -Luckily, the leaves are a deep green color with no yellow/brown spots, but they are limp and not all, but a couple are looking wrinkled. -Upon inspection, I found that the orchid had barely any root system–it had been living in a brown plastic container filled with moss medium. I can’t tell how much of the root system has rotted away; if old rotten roots were buried in the moss. I used sterile scissors to cut away everything that looked brown/black or soggy; there was some, but really not that much rotten roots to speak of. The 2-3 roots that are still around are firm. When I watered them, they became a more vibrant pale green, but as the day went on they went back to their silvery grey/green color. -There is the 1 set of roots that was sitting pretty much on top of the moss, then there are 2 aerial sets of roots. -There was 1 blossom that, 2-3 weeks ago, was looking strong, but since has gone limp and sad. I cut it off above a healthy looking node close to the leaves–I was hoping to get rid of parts of the plant, so that the roots can work on getting well before using energy on other parts that, at this point, aren’t so important. -I am using a large clay pot (without holes) and I’ve put the plastic container, but upside down to create a shelf/seat. Then (because I don’t want to spend money on this project if it will end poorly) I tore up a large pulp-paper/recycled egg carton into large pieces instead of bark for the orchid to sit on/sit in. I’ve put some water into the large clay pot, but not so much that the roots are touching it. -I can’t tell if this orchid had previously been overwatered or underwatered. And so I don’t know which approach to take in these first few weeks of trying to help it along. -Is it possible or a good idea to cut the orchid into 3 smaller plants, since it has 3 root systems? Will that be beneficial for it? -Are aerial root systems strictly aerial roots forever? -If it is dehydrated, what are your thoughts on placing a clear plastic bag over it to promote humidity and hydration? -Any ideas on how long I’m looking at in regards to seeing progress? I’d appreciate any and all the advice you can give me. Thanks! Hi there and thanks for your questions! I’ll try to answer them as best I can. Because the leaves are wrinkled, it sounds like the plant is dehydrated. However, this is not necessarily due to underwatering. It sounds like the roots may have rotted off due to overwatering, in turn leaving the plant with not enough roots to keep the whole plant well hydrated when it does get watered. Definitely don’t try to split the orchid into 3 separate plants. Phalaenopsis orchids aren’t meant to be split up, especially when they are ailing. Aerial roots are normal for Phalaenopsis orchids, as they are epiphytes (in the wild grow off of tree branches, rocks, etc and gather water and nutrition from the surrounding environment). Aerial roots may not be aesthetically pleasing, but they are fine — just make sure to mist them every day or two to make sure they don’t dry out too much. I don’t recommend trying to bend the aerial roots to fit into the pot, because they can easily break off. You can certainly try this. I’d also recommend making a humidity tray to set the pot upon. Unfortunately there’s no way for me to tell how long it will take for the plant to recover. My advice is just be patient and you will hopefully be rewarded for your work! My orchid I received in October. I live in the Southern Hemisphere so summer at the moment. My orchid was in bloom when I received it and one of the bottom leaves was wrinkly and yellow, the orchid know-all that I saw at the time said it was just old age and the lower leaf out of six was plucked off. He also gave me some of his fertilizer the uses on his own orchids (Which look amazing!) and I followed his instructions to the dot. That was Christmas, Now the other lower leaf is doing the same, I presumed old age as well as it is opposite the other. But I noticed that I watered it over two weeks ago and it had still not gone dry or evaporated in the hot weather we are having. This suggested to me that the roots had a problem so I dumped the orchid (now not in bloom) out onto a tray and found that probably 98% of the roots have gone brown and like hollow straws. There had been a new root sprouted at the very base and is about as long as my smallest finger. This and another piece about the same size are all that are still not mushy and dead looking. I am wondering if it is at all possible to save the plant if I trim off all the dead matter and place in some new dry material such as peat moss? The top two leaves are still think and green but both bottom leaves show dehydration/old age yellowing wrinkly and its just beginning on the second leaf on the side with three still left. Hi there – I’ve had similar experiences with some orchids. I’d recommend trimming the dead roots and repotting, like you suggested. Potting in an orchid bark mix may do better for your orchid, as sphagnum moss doesn’t allow for as much air flow around the roots. Once it’s repotted, you’ll want to keep your orchid in a humid area, but make sure not to overwater it. Good luck and happy growing! I did that exactly, I might employ the plastic bag technique to increase humidity. Also figured instead of watering heavy once every 1-2 weeks just do a little bit cause it can only soak up so much with so little root system. I was given an orchid as a gift. It’s my first orchid and I really love it. The problem is that it has some yelow-brown roots. I’ve read that you recommened to repot new orchid and trim rotten roots, but my flower is blooming. What should I do? It does sound like the roots are beginning to rot. Even though your orchid is in bloom, I’d recommend trimming the rotting roots away and repotting, to help prevent further problems down the line. Just handle your orchid delicately when you remove it out of the pot so that you don’t break any of the blooms off! Should I buy new orchid bark mix? Can you suggest what kind of bark mix is better? Hi, I have been growing my phal for over a year. I like to think I take pretty good care of it. When checking if my roots are healthy I have found lots of fresh green ends in and around the inside of the pot. Does this mean my root system is healthy or should I still be checking for rot? Also, do you have any tips to make the possible new branch grow faster so I see some flowers sooner rather than later?? I think I killed my plant. I have been trying to take care of, repotted added new moss, changed its position. She is just not happy also tried miracle grow in the water and not so good. All the roots are rotten. The leaves were healthy but now look yellow streaked. I cut off all dead roots. Please any advise??? Hi there, it’s hard to tell what’s causing your orchid issues, so I recommend reviewing my basic orchid care tips (http://bklynorchids.com/2010/04/19/beginner-tips-on-how-to-grow-phalaenopsis-orchids/) and how to water a phalaenopsis orchid (http://bklynorchids.com/2010/03/12/how-to-water-a-phalaenopsis-orchid/). You may want to switch from moss to an orchid bark mix – moss retains a lot of water and could be causing roots to rot. You should also a fertilizer made specifically for orchids (personally I use the Grow More brand). Cutting off the dead roots was a good move – you may want to buy some SuperThrive, mix a drop of it in a gallon of warm water, and soak your orchid in that for an hour…the repot it in bark mix. 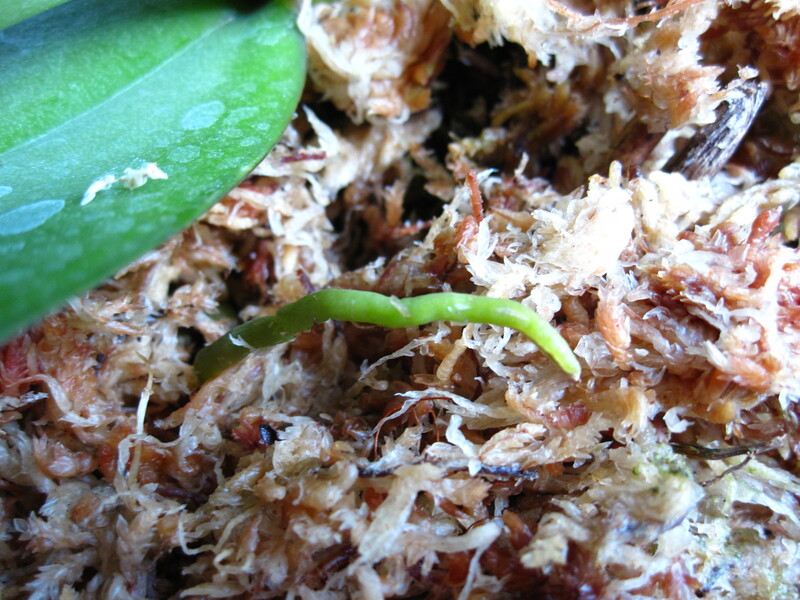 SuperThrive is a rooting hormone and can help orchids put out new roots to support the plant’s growth. Good luck with your orchid! I adopted a phalenopsis within the last month or so from my aunt. It seems to be a very healthy plant albeit flopped over. A new leaf has started growing and I have ariel roots. My aunt mentioned something about it getting ready to flower but I see no shoots. I believe the it has some dead roots in the pot. Should I repot now or wait until after the new leaf has stopped growing to see if shoots start coming up? I did have one leaf that turned yellow. Also is there anything special I need to do to sterilize the tools? I would recommend repotting now to make sure you get rid of any old, rotten roots to keep the rot from spreading. To sterilize, you can use rubbing alcohol or a flame along the tool’s edge. And you can check out my post about how to tell the difference between a root and a spike to see if any of your aerial roots are actually spikes! I have just received a Phal Orchid for the holiday season and I am so nervous because I love plants but I’m a beginner when it comes to Orchids. It came in a clear plastic container with draining holes. All aerial roots are firm and crispy although some are a bit brown when they fold over. The roots I can see through the moss are green and healthy, but a couple of brownish, mooshy-ish roots are poking out of the bottom holes. I have a quick question about re potting a phal. If the roots are rotten and need to be cut, do I need to put cinnamon on them?? Hi there and thanks for your question. I don’t usually apply cinnamon to the cut areas where I removed rotten roots, and my orchids have done fine without it. I typically only put cinnamon on the tip of a spike after I cut it, or the cut edge of a leaf if I needed to remove part of it. I hope that helps! I came across your site looking for answers on how to save my orchid. I believe it’s dying, but I’m not sure. It’s a Phalae orchid and has two stems. one of the stems has completely lost of all its flowers, while the other looks exactly how it did when I bought it. I checked the roots (which I should have done immediately after purchasing) and I found some rotting ones, but for the most part they’re like a green yellow-ish color. Is this normal? Are the flowers falling a result of a dying orchid? The bottom leaves are still rich green in color, but I’m wondering if it’s on the verge of dying. I want to save it as soon as I can (if it’s not too late). I hope you can help. Thank you! Hi I need help. I bought 2 phals from bj’s. The white phal started having sections of the petals that were drying out (I mean. Small spots. They eventually turned brown. I was thinking it was a fungus so I dissed it with cinnamon. Is that enough ? The other phal had two large good roots but most of the roots under the plant were yellow and sickly however it had branches of green roots off the yellow roots. Should I cut this root from the base or leave it. Parts of the root were showing brown stains and shriveling as well on the surface. Both plants are in full bloom. A third that I bought, I just snipped off all the yellow and brown roots and repotted while 2 spikes were in bloom. I added cinnamon to prevent more rot when I repotted in perlite charcoal and bark. Problem is while the blooms seem to be ok, all the leaves have gone totally flaccid. No matter what I do they don’t seem to get water but the blooms and new blooms are ok. I watered a bit more after I repotted but to no avail. Should I just wait patiently if so how long for before I water again. It’s been 5 days since I watered and watering helped the blooms but not the leaves. Help! Hello my fiancé bought me a new orchid for valentines day. I can see it has some root rot and needs to be repotted with fresh medium but its in the middle of blooming. I don’t know what to do because it looks like there may be some greenish mold on some of the rotten roots. I don’t want to ruin the blooms but I dont want wait and kill the orchid completely. What should I do? Hi Lynda, I’d go ahead and repot even though the orchid is still in bloom. Just be extra careful handling the orchid so you don’t break the spike or blooms off! It’s easier to repot while an orchid isn’t blooming, but since there’s some root rot it’ll be better for the orchid’s long term life. Good luck and happy growing! There are 2 tiny slightly green roots and 3 medium size that are soft and mushy and then the base of roots are small hard and dark brown that crumble away. There are 3 leaves all wilted and the bottom leave is turning yellow. It looks in terrible shape. Happy to post a pic but I am not sure how to do this?? Hi Courtney, the orchid doesn’t sound like it’s in good shape but that doesn’t mean it won’t make it. I’d recommend taking it out of the pot and trimming away the rotten roots using a sterile cutting implement. You might want to pick up some rooting hormone (like SuperThrive or Dyna-Gro KLN…both are available on Amazon) and mix it up according to the label instructions, then soak the orchid in the solution for an hour before repotting it. This should help the plant start to put out new roots, which will support further growth. I hope that helps – good luck! Thanks for the advice, I have removed the dead roots and cut the stem and soaked the leftover roots in fertilizer. Why are the leaves soft and droppy? Is this over watering? There are 3 leaves and the bottom leave is yellowing. Also where should I keep it? On a windowsill in direct light doesnt seem to work…. I am going to get some orchid potting mix today and repot. I think the tan bark on its own wasnt enough for the roots to bind too. The leaves are probably drooping because the roots aren’t in good shape—the roots help support the orchid’s overall growth. Overwatering can certainly lead to root rot. I wouldn’t water your orchid until the potting medium is nearly dried out. I’m not sure if soaking in fertilizer will help, I’d definitely try to get some rooting hormone if you can find it. Usually Lowe’s and Home Depot have some, or maybe your local gardening shop. Phalaenopsis orchids do well in bright, indirect light. What direction does the windowsill face where you’ve been keeping it? Southern or eastern exposure is best. I have an orchid that I have been trying to nurse back to life for the last 4-5 months. It has been looking good, it even started to grow some new leaves. I realized when I first got it, at the time it was in pretty rough shape, I had never inspected the roots. Today I took it out to look at it and to my disbelief none of the roots look healthy. Clearly some of them are working, given it’s new foliage, should I leave them all? Trim them all? Guess? Hi Daniel, I would trim away all of the roots that are in bad shape because once they start to rot they’re not going to do the plant any favors. If cutting away the rotten roots leaves the plant with few to no good roots, you can try soaking the plant in a rooting hormone like Superthrive or Dyna-Gro KLN (available online and sometimes at big box home improvement stores or local gardening shops). Just make sure to mix up your rooting hormone solution according to the label instructions and use warm water, then soak the plant for an hour before repotting it. Good luck and happy growing! Any recommendation to how often I should do this? I’m not sure if there’s a general recommendation on how often to soak in rooting hormone but I’m guessing it’s not great to do too often. Taking an orchid out of its pot and then repotting will stress the plant. If you want, you can add a drop of rooting hormone to your water before watering your orchid and use that on a regular basis. That way your orchid will get the benefit of a bit of rooting hormone more regularly without having to go through the stress of unpotting and repotting. can somebody tell me what yellow roots mean. Does it mean their old????? I’m not sure if yellow roots mean that they’re old, but they are generally still okay as long as they’re firm, not mushy or hollow to the touch. Hi! I have a VERY healthy phal that I have in no medium, (I bought a bag of medium that was contaminated with some sort of bugs and it thrived, so I kept it bare), complete with a keiki at its base, that I’ve had for about 2 1/2 years. I noticed tonight that it has several hot pink roots that appear to be fat and healthy in every other aspect. I haven’t fertilized recently. I can’t find ANY info on pink roots, and I’m concerned. Any idea what could be going on? Thank you in advance! Feel free to email me personally. Hi there – and wow, that’s interesting, I have never seen or heard of pink roots before. I guess it could be related to whatever fertilizer you’ve used, but since you haven’t fertilized recently I don’t know. I’d recommend signing up on the orchid forum at http://www.orchidboard.com/community/ and asking around there – someone there might have some idea of what it means. You can also upload pics to show the members. It sounds like your orchid is healthy, so that’s good, at least. Sorry that I can’t be more help, and good luck! I re-potted my orchid in April and cut dead roots off. It’s been getting new leaves but the roots looks shriveled and dead. There might be a few within the container that are alive. Should I cut the dead ones back again even though it’s growing new leaves or leave it alone. Why are they dying? I do the three ice cube thing… Is it too dry? My other orchids seems fine and flower… I think my humidity is decent… Any suggestions? Also, in April I re-potted a second orchid, the roots were so bound, mushy, and dead so I cut them back. I essentially had to cut them all. It’s been four months but there are about 5 new roots growing… And the three leaves still there are green. Will it be a goner? How should I water it? The roots are long enough that the ice cubes do much. Anything else I can do? Lastly, how do I fertilize that one and my other orchids? I have an this orchid for 3 yrs and it has not flowered since I got it. I have never cleaned or repotted it and seems to be in good health. It is growing all sorts of root like growths even from the newer upper leaves. Is this good and how can I get it to flower? Hi Michelle, it sounds like your orchid is doing well. I do recommend repotting it so you can check and make sure that the roots are healthy – and trim away any that might not be.